BACKGROUND AND PURPOSE: In acute middle cerebral artery (MCA) stroke, CT angiographic (CTA) source images (CTA-SI) identify tissue likely to infarct despite early recanalization. This pilot study evaluated the impact of recanalization status on clinical and radiologic predictors of patient outcomes. MATERIALS AND METHODS: Of 44 patients undergoing CT/CTA within 6 hours of developing symptoms of proximal MCA ischemia, 19 patients achieved complete proximal MCA (MCA M1) recanalization. Admission National Institutes of Health Stroke Scale (NIHSS) score, onset-to-imaging time, CTA-SI Alberta Stroke Program Early CT Score, MCA M1 occlusion, cerebrovascular collaterals score, and CTA-SI lesion volume were correlated with 3- to 6-month follow-up modified Rankin Scale (mRS). We developed 2 stepwise regression models: one for patients with complete MCA M1 recanalization and one for patients without complete recanalization. RESULTS: Complete and incomplete recanalization groups had similar median admission NIHSS scores (19 versus 19) and mean onset-to-imaging times (2.3 versus 1.9 hours) but different proportions of patients achieving mRS scores 0–2 (74% versus 40%; P = .04). The only independent predictors of clinical outcome in patients with complete recanalization were onset-to-imaging time and admission CTA-SI lesion volume (total model R2 = 0.75; P = .01). The only independent predictors of outcome in patients with incomplete recanalization were admission CTA-SI lesion volume and NIHSS score (total model R2 = 0.66; P = .007). CONCLUSION: Regardless of recanalization status, admission CTA-SI lesion volume was associated with clinical outcome. Recanalization status did, however, affect which variables in addition to CTA-SI volume significantly impacted clinical outcome: time with complete recanalization and NIHSS with incomplete recanalization. This finding may support the development of a model predicting the potential clinical benefit expected with early successful recanalization. Identifying predictors of clinical outcome after thrombolytic therapy for acute ischemic stroke may improve patient selection. However, clinical examination and unenhanced CT, the current standards for admission evaluation, are limited in predicting which patients are likely to improve with or worsen without recanalization.1–8 Although the predictive capabilities of imaging techniques, such as diffusion-weighted imaging (DWI), CT cerebral blood volume, xenon CT cerebral blood flow, positron-emission tomography, or transcranial Doppler sonography have been demonstrated,9–14 patient and site-specific factors limit the widespread application of these technologies in the acute setting. We sought to characterize the role of admission CTA-SI and other relevant clinical variables in determining clinical outcome among acute stroke patients who undergo attempted recanalization. Because the success of recanalization is unknown at presentation and can impact clinical outcome, we divided patients a priori into 2 cohorts based on the degree of recanalization later achieved. We retrospectively reviewed the clinical and imaging findings of consecutive acute stroke patients who presented to 2 centers with symptoms of proximal middle cerebral artery (MCA) ischemia within 6 hours of symptom onset, underwent admission unenhanced head CT and CTA evaluation, had recanalization status assessed by hospital day 2, and ultimately received follow-up brain imaging to confirm the diagnosis. Follow-up modified Rankin Scale (mRS) scores were obtained by direct patient interviews 3–6 months after symptom onset as part of an institutional review board-approved data collection process. There were no instances of a documented recurrent stroke either by follow-up imaging or by clinical deterioration before follow-up mRS. The 3-mm-thick axial CTA-SI were evaluated for the presence of ischemic regions by identifying areas of relative hypoattenuation.26 Using a semiautomated software package (Alice; Parexel, Waltham, Mass), these ischemic regions of interest were visually segmented to determine total lesion volume. CSF spaces, blood vessels, and other volume-averaged tissue were excluded. Segmentation was performed by 2 senior raters experienced in the interpretation of stroke CT and blinded to other admission and follow-up clinical and radiographic data. Images were analyzed independently during multiple readout sessions by using optimal window width and center level settings to identify subtle differences between normal and hypoattenuated brain parenchyma.27 Raters graded all of the scans for each of the following findings: Alberta Stroke Program Early Computed Tomography Score (ASPECTS) on unenhanced CT,28 MCA M1 segment patency on CTA, leptomeningeal and Sylvian collateral circulation on CTA, ASPECTS on CTA-SI (including individual regional subscores), and segmented CTA-SI lesion volume. ASPECTS was reported on CTA-SI in preference to unenhanced CT, given previous observations that CTA-SI ASPECTS is more sensitive to ischemia.29–31 Collateral vessels were graded in the following manner: 1, absent; 2, less than the contralateral normal side; 3, equal to the contralateral normal side; 4, greater than contralateral normal side; and 5, exuberant. Disagreements in ratings were resolved by consensus-blinded re-review. Patients were divided a priori into 2 distinct groups: those who achieved complete recanalization and those who did not. Univariate analyses (χ2, Fisher exact, and Mann-Whitney U tests) were performed to assess differences between the 2 groups in baseline characteristics and clinical outcome. Within each group, univariate Pearson and Spearman correlation coefficients (R) were used to examine the relationship between clinical outcome (mRS) at 3–6 months and the admission parameters of the following: 1) NIHSS score; 2) time from symptom onset to first imaging (onset-to-imaging time); 3) presence of proximal MCA occlusion on CTA; 4) presence of Sylvian fissure or leptomeningeal collateral circulation on CTA; 5) ASPECTS on CTA-SI; 6) presence of a motor strip lesion on CTA-SI (by ASPECTS subscore); and 7) CTA-SI lesion volume. For each recanalization group, a distinct stepwise elimination multiple regression model was constructed to identify which of the candidate variables were associated with the largest relative contributions (R2) in predicting clinical outcome (mRS) at 3–6 months. A preliminary regression was run by using all of the terms; only when this preliminary model was significant at the .05 level was a stepwise regression run to determine the final model. Post hoc stratification was performed for the 2 variables that had the greatest cumulative capacity for predicting clinical outcome in each model. Pairwise comparisons by using Scheffe multiple comparison procedure were conducted only among those variables with P value at less than .15 in the stepwise regression; variables not meeting the P value at the .15 level of significance were excluded from the final regression models. Forty-four patients met criteria for analysis. The characteristics of these patients are displayed in Online Table 1. Nineteen patients had complete recanalization, with an average age of 67.3 years (SD, 18.7 years); 63% were female. Twenty-five patients had incomplete recanalization, with mean age of 73.3 years (SD, 10.7 years); 48% were female. The complete and incomplete recanalization groups had similar median admission NIHSS scores (19 versus 19; P = .27), mean onset-to-imaging times (2.3 versus 1.9 hours; P = .24), and frequency of proximal MCA involvement (58.0% versus 52.0%; P = .77) but different proportions of patients achieving mRS 0–2 (73.7% versus 40.0%; P = .04). Median ASPECTS was 8 (range, 1–10) in completely recanalized patients versus 9 (range, 3–10) in incompletely recanalized patients (P = .03). Of note, only one symptomatic intracerebral hemorrhage was observed, specifically in a patient who did not achieve complete recanalization. Factors associated with clinical outcome in univariate analysis are listed in Online Table 2. In the complete recanalization cohort, proximal MCA occlusion (R = 0.66; P = .002), onset-to-imaging time (R = 0.63; P = .004), and CTA-SI lesion volume (R = 0.50; P = .03) were the only findings that correlated with clinical outcome (mRS) in the univariate analysis. In the incomplete recanalization cohort, the following factors correlated with outcome in univariate analysis: CTA-SI lesion volume (R = 0.68; P = .0002); admission NIHSS score (R = 0.52; P = .008); proximal MCA occlusion (R = 0.27; P = .02); CTA-SI ASPECTS (R = −0.57; P = .004); and ASPECTS subscore involvement of the insula (R = 0.55; P = .004), “M5” (motor/premotor) region (R = 0.51; P = .01), and “M6” (sensory) region (R = 0.47; P = .02) on CTA-SI. CTA-SI lesion volume was the only variable that strongly correlated with follow-up mRS score in the univariate analysis for both complete and incomplete recanalization cohorts. Multivariable analysis was subsequently performed for each of the 2 cohorts, with and without complete recanalization (Fig 1). For the complete recanalization group, the independent predictors of outcome were onset-to-imaging time (R2 = 0.39; P = .001) and admission CTA-SI lesion volume (R2 = 0.30; P = .005) with a cumulative R2 of 0.69 (P = .0001). The addition of a third variable (the presence of a proximal MCA stem occlusion) resulted in a statistically significant model with the highest total R2 (R2 = 0.75; P = .01), though the incremental contribution of this third variable was minimal (incremental R2 = 0.05; P = .10). Within this complete recanalization group, admission NIHSS or proximal MCA occlusion did not contribute any additional predictive capacity beyond that predicted by onset-to-imaging time and CTA-SI lesion volume. Multivariate predictors of outcome in patients with complete recanalization and in patients with incomplete recanalization. The model R2 represents the sum of the incremental R2 values of each selection variable added to the model in stepwise fashion. Of note, the presence of leptomeningeal collaterals had an inverse correlation with mRS, though the reported R2 is positive by definition. In addition, whereas both models remained strongly significant after step 3, variables added in step 3 of each model did not significantly increase the overall predictive capacity (R2) of each model beyond that provided for by the initial 2 variables. For the incomplete recanalization group (Fig 1), the independent predictors of outcome were admission CTA-SI lesion volume (R2 = 0.47; P = .0003) and NIHSS score (R2 = 0.16; P = .02) with a cumulative R2 of 0.63. Adding the CTA-SI leptomeningeal collateral score resulted in a statistically significant model with the highest total R2 (R2 = 0.66; P = .007), though the incremental contribution of this third variable was minimal (incremental R2 = 0.04; P = .14). Within the incomplete recanalization group, onset-to-imaging time or proximal MCA occlusion did not contribute any additional predictive capacity to the model beyond that predicted by CTA-SI lesion volume and NIHSS score. In this pilot study of 44 patients with acute symptoms of proximal MCA occlusion, we observed that the eventual recanalization status affected which clinical and CTA-based admission variables best predicted clinical outcome. In our analysis, we found that admission CTA-SI lesion volume was an independent predictor of outcome both for those patients achieving complete recanalization and for the cohort who did not achieve complete recanalization. Onset-to-imaging time added predictive value only among patients who achieved complete recanalization, whereas NIHSS score added predictive value only among patients who did not achieve complete recanalization. 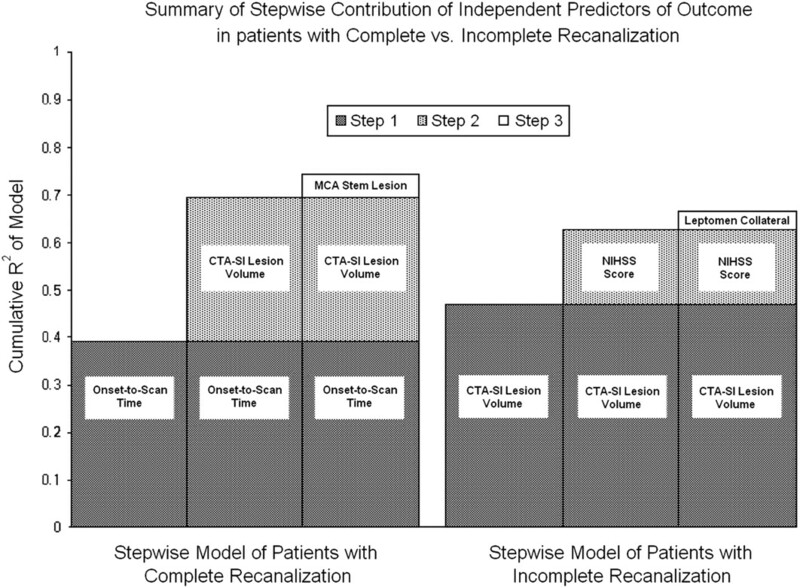 By constructing 2 separate multivariate stepwise linear regression models based on recanalization status, our analysis provides an important consideration for how a quantitative “benefit of recanalization” model might be optimally constructed. Although others have shown that mismatch between NIHSS and unenhanced CT does not reliably identify the ischemic penumbra depicted by MR imaging diffusion-perfusion mismatch, NIHSS and CTA-SI were strongly associated with clinical outcome in this study,32,33 which may reflect that the sensitivity of CTA-SI for irreversible infarction is higher than unenhanced CT and more closely approaches the higher sensitivity of diffusion MR imaging.34 The differential impact of the NIHSS score in our cohort of patients without complete recanalization might relate to our high frequency of proximal MCA occlusions, a setting in which the NIHSS strongly correlates with clinical outcome as measured by mRS.22,35 These results are consistent with the hypothesis that the quantity and duration of tissue injury most strongly influence clinical outcome after successful thrombolysis. The longer the tissue represented in the CTA-SI lesion volume remains ischemic or oligemic, the more likely it is to convert from viable tissue with electrical dysfunction (as expressed in the initial stroke severity) to tissue with irreversible infarction, yielding a clinical outcome closely related to the initial stroke severity and infarct size.22,36–39 However, in patients who undergo early complete recanalization, the admission NIHSS score may not be reflective of the degree of disability at 3 months. Consistent with this hypothesis, NIHSS in this analysis did not add value to the prediction of clinical outcome among patients with complete recanalization, many of whom achieved recanalization within the first few hours of treatment. Our analysis included independent predictors of outcome described previously in the MOST and PROACT II studies.14,41 Although our data are consistent with the observations of improved clinical outcome seen in these and other major intra-arterial thrombolysis trials,2,41–43 certain findings are unique due to the a priori separation of patients into cohorts based on recanalization status. For example, the MOST analysis concluded that time to treatment does not independently predict clinical outcome, but it assessed time to treatment in all of the patients, not just among those with early complete recanalization.14 Although proximal MCA occlusion has been shown previously to have an independent effect on clinical outcome regardless of reperfusion status,44–47 this factor had limited power to further discriminate outcomes in patients selected specifically for symptoms of proximal MCA disease. Moreover, proximal MCA stem occlusion may not add additional value if CTA-SI lesion volume is a better predictor of clinical outcome; CTA-SI may be a better intermediate marker of the tissue hypoperfusion often induced by proximal MCA occlusion. When MCA occlusion does not produce tissue hypoperfusion due to the presence of robust collaterals, then CTA-SI may have even more discriminating power. Of interest, proximal occlusion was a strong predictor of outcome in the MOST analysis, but no other measures of perfusion deficit were included. Predicting outcome in acute stroke patients nevertheless presents many challenges, and our study has several limitations. The penumbra, as visualized on imaging and as expressed in clinical deficits, may be highly dynamic and may be influenced by factors such as hemodynamics, oxygenation, blood glucose, temperature, hematocrit, time, and collateral blood flow.48 Flow thresholds for various states of tissue perfusion vary considerably among studies and techniques applied.49 Many of these variables could not be controlled for in our model. The use of recanalization status rather than treatment method removed the selection bias associated with choice of recanalization treatment type, but the CTA-SI data may have influenced the decision to provide any recanalization therapy. Although other investigators have blinded clinicians to an experimental imaging technique,50 we were investigating an imaging technique in routine clinical practice. In this retrospective pilot study, we assessed recanalization rather than reperfusion, because not all of the patients underwent conventional transfemoral angiography or follow-up perfusion imaging. Because CTA, MR angiography, and transcranial Doppler sonography do not adequately assess distal tissue perfusion, we were not able to assess for conversion of a proximal MCA occlusion to a distal MCA branch occlusion, and we were unable to measure thrombolysis in myocardial infarction flow, which strictly requires assessment of distal perfusion. Accordingly, we limited our analysis to recanalization of the proximal MCA stem, where MR angiography, transcranial Doppler, CTA, and conventional transfemoral angiography are all adequate to determine recanalization status. Other investigators have either used or advocated a similar scoring methodology for recanalization.14,23,24,51 The benefit of studying a heterogeneous cohort, of which only a portion underwent conventional transfemoral angiography, is balanced by the consideration that treatment allocation to intravenous thrombolysis, angiography, or both is unknown at the time of triage, the time at which a broadly applicable model is most useful. In this cohort of acute stroke patients with symptoms of proximal MCA occlusion stratified by recanalization status, a relatively simple “stroke outcome prediction score” based on admission CTA-SI lesion volume, NIHSS score, and onset-to-imaging time was able to strongly predict clinical outcome. Comparing the expected functional outcome (mRS) for patients in the “best case” scenario (ie, complete and early recanalization) versus “worst case” scenario (ie, partial or no recanalization) could permit improved patient selection for reperfusion therapies or clinical trials. Based on our pilot data, a larger prospective study of a “benefit of recanalization” model in acute ischemic stroke is warranted. Paper previously presented at: Annual Meeting of the American Society of Neuroradiology, June 5–11, 2004; Seattle, Wash.
E.S.R. and L.H.S. are co-first authors. Accepted after revision April 4, 2008.